ANDOVER – Primary student Tucker Compan and High School Student Kali Siembor were given recognition as January students of the month (as they had been absent last month), as was fourth grader Haylee Lane and High School Student Logan Mason as February students of the month during Pymatuning Valley’s monthly board of education meeting on Monday, March 11 at the high school. (From March 15 edition). According to Compan’s teacher, Rachel Timlin Tucker is a bright, compassionate and kind student, has a positive attitude, is caring, has a nice smile and excels in what he does. Similarly Steve Urcheck praised Kali Siembor by noting how she excels and thrives on a daily basis, is a concerned student, has consistently high grades, is kind to everyone, thinks of others, is a great team player, is fun and brings a smile to his face. In regards to February primary student of the month, Fourth Grade Teacher Tony Todaro praised Haylee Lane for her A-efforts, her leadership, how she is well-liked, how she lights up the room and is a wonderful student, followed by Anne Siembor’s honoring of High School Student Logan Mason’s strong dedication volunteering at the concession stand for the boosters, how he has a great attitude, how he is a dedicated student, as well as has a great attitude. 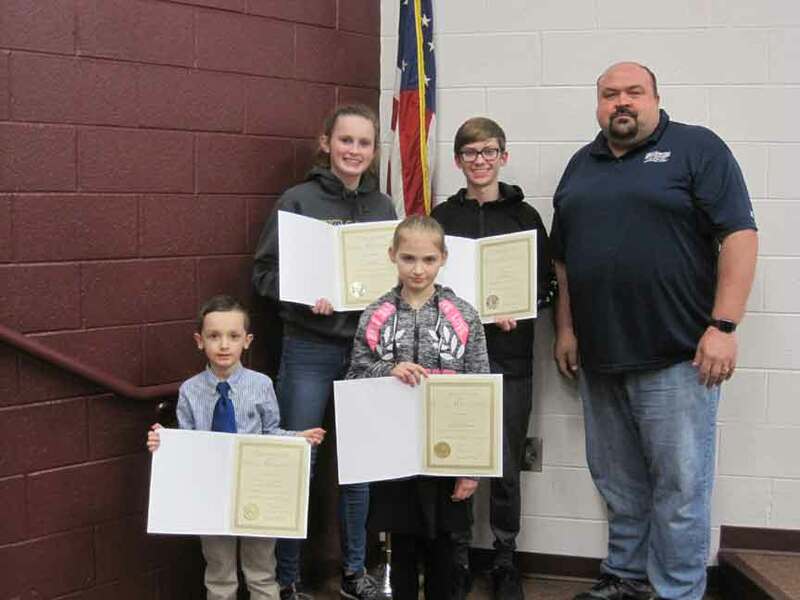 All four students were presented awards on behalf of the Pymatuning Area Chamber of Commerce through Jason Hockran who is owner of H&H Enterprises and is Associate Pastor of Andover United Methodist Church. Logan Dickens will also be awarded Middle School February Student of the Month but was absent the night of the board meeting. Pictured: Kali Siembor, Logan Mason, Tucker Compan and Haylee Lane showing off their student of the month awards alongside H&H Enterprises Owner and Andover UMC Associate Pastor Jason Hockran (as a representative of the Pymatuning Area Chamber of Commerce) on Monday, March 11 during PV BOE’s monthly board meeting at the high school.